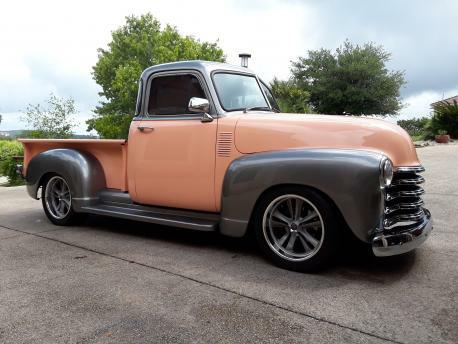 Description: This is a frame off restored 1953 Chevrolet 3100 5 Window Pickup Truck that I purchased in Scottsdale Arizona at the Barrett-Jackson Auction. When I purchased it the truck was almost finished. The people who were working on it seemed like they were in a hurry to get it to the auction. I have spent lots of money to finish the fine detail that this truck deserves. It is built on an S10 frame and the modified 350 engine and automatic drive-train are in perfect condition with less than 600 miles since the build. The engine is fully chromed and the ac blows cold. New Chip Foose Knuckle Wheels and Bridgestone Tires. Brand new interior with leather seat, stereo, alarm, siren, and Spal electric cooling fan. Everything on this truck is brand new. You will not at all be disappointed in the detail that went into building this truck. Please feel free to ask questions... Thank you so much for your interest.